Electronic Arts' military shooter set during the modern war in Afghanistan could have lost its official U.S. Army support over the inclusion of Taliban fighters as playable characters in the game's online mode, military officials told Kotaku. The U.S. Army, which officially supported the development of Medal of Honor, didn't find out about the inclusion of playable Taliban fighters in the game until the title was nearly finished, said Kenneth Hawes, director of the U.S. Army's Public Affairs Office Western Region. Despite working with the developers on capturing sound, going over the campaign's story and allowing photo shoots of vehicles like the Apache attack helicopter, the U.S. Army was never told about the game's multiplayer modes, Hawes said. The director learned of the Taliban's inclusion after the issue made a splash around the world in media reports following the game's showing at the annual E3 video game convention in Los Angeles. "We immediately contacted Electronic Arts and asked them to give us a demonstration of the game's capabilities," Hawes said. Hawes and a team traveled to the studio on Aug. 27 to see the game's multiplayer modes first hand. What he saw did not please him. "You have to understand I'm not a gamer," Hawes told Kotaku. "We provide support on major motion pictures, television and video games, but I didn't grow up with video games. So personally I was a little disappointed they included that scenario." Hawes said he understands that when a military shooter has an online element there needs to be "theoretical good guys and theoretical bad guys." "But our concern is that this is an ongoing conflict, soldiers are engaged every day, our sons and daughters are dying at the hands of the Taliban," he said. When asked what the reaction of the Department of Defense was when he passed on the word of the nature of the Taliban's inclusion in multiplayer he said he thinks they were "a little surprised." Electronic Arts declined to comment for this article. While not necessary, early on in the development of their latest Medal of Honor game, Electronic Arts approached Hawes' office for official support of the game by the Army. That entails the Army and the developer signing a production assistance agreement which gives the Army a chance to check out the product being made and the movie, TV or video game developers access to locations, weapons, soldiers and vehicles. Ret. Lt. Col. Greg Bishop, who worked under Hawes overseeing the support before retiring, told Kotaku that he and his team worked with EA on a number of things for the game including recording sounds of weapons being fired and granting the developer access to Apache helicopters for digitizing. They even rigged several Apache helicopters with microphones during a training event to capture the sound of the weapons being fired. 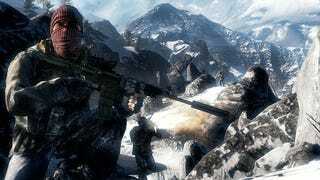 Bishop said he initially had concerns over the idea behind the game, a military shooter set during a ongoing conflict, but meeting with the developers assured him. "We had a really good meeting with them and they expressed not only their level of respect for the American soldier but showed us how the franchise has always been that way," Bishop said. And, Bishop said, the developers really seemed to know what they were talking about. But they didn't hear a thing about multiplayer gameplay. "I don't think there was anything nefarious about them not showing it to us," he said. "They were always respectful of us. They realized they were treading on some delicate ground." Retired Army Captain Brian Chung, who was wounded in Iraq and awaiting medical discharge when EA came to the U.S. Army for support, also helped out on the game. It's Chung's finger pulling the trigger on most of the weapons you hear in the game. Chung said he was impressed by the developer's attention to detail and realism. "The video game is loosely based on actual events and we were bringing in colonels and generals of that war," he said. "When they saw it they were blown away. "One colonel started sweating when he saw the demonstration." Chung also thinks Electronic Arts' failure to show the Army the game's multiplayer was accidental. He first heard about the inclusion of Taliban when he read about it on Kotaku, he said. His reaction was mixed. "The whole notion of cops and robbers or cowboys and Indians, that doesn't work," he said. "This isn't in the past. If you say Taliban and U.S. troops, that is going on now, there are soldiers dying every day." "The Army's support of the game was based on the single player only," Chung said. "My understanding is that they were only 80 percent done with single player and hadn't started multiplayer development yet." Bishop said that knowledge of the multiplayer mode would certainly have raised red flags for the Army. "If we would have asked the question, or they would have told us, if we would have known, we would have come up with a solution," Bishop said. Chung and Bishop now run private consultant company MUSA Consulting, which works as a liaison between the entertainment world and the military one. Bishop says understanding the culture of the military and gaming can help avoid these situations. "If you don't know the culture, if you don't understand the people, it is easy to step on a PR land mine," Bishop said. While the U.S. Army has no legal repercussions when they disapprove of something that goes into a movie, television show or video game they supported, they can officially withdraw their support. The problem is that much of this process is front loaded, with the approvals and the help given early on. This late in the game, there is very little the Army can do. "From a legal stand point we have have no legal authority to make a production company or developer change something," Hawes said. "In this case we provided support based on the original outline." While Hawes said that the Army withdrawing support for the game after it was completed would have been nothing more than a "statement of disappointment," they still considered it. "That did come up, withdrawing support," he said. "We never did send a formal letter to Electronic Arts pulling support, that would have been a meaningless document." Hawes and Electronic Arts' Jeff Brown both say that there was never a formal request by the Army to remove the playable Taliban, but almost exactly a month after the Army saw the game in action and expressed their disappointment, that's what EA did. In a statement released today, the Medal of Honor developers said they were renaming the Taliban to Opposing Force in the mulitplayer modes of the game out of respect for the friends and families of fallen soldiers. Hawes said the Army received notice of the change in the game at the beginning of this week. While Hawes said that the issue hasn't resulted in any change of policy, he did say the miscommunication will "help us in the future." "We learn from every experience," he said. "We are pleased they changed it from the Taliban, only time will tell if they went far enough."